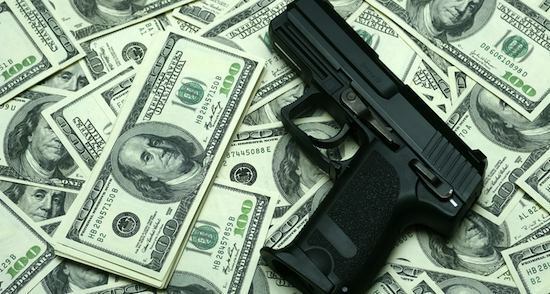 WASHINGTON, DC—According to a new poll released by the Pew Research Center, a giant pile of cash and guns has taken the lead for the GOP Presidential nomination. “With 35% of the support of likely voters, the 6-foot pile of stacked $100 bills and firearms has officially passed Donald Trump in the Republican race,” said head researcher Gerald Watkins. Reportedly, the conglomerate of money and semi-automatic weapons had been trailing for months, but recent commercials highlighting the candidate’s commitment to the economy and the second amendment has led to a surge in support. The pile’s opponents have started to resort to similar tactics, including carrying around buckets of cash and repeatedly shooting revolvers into the air during stump speeches, but over 20% of poll respondents have said that only the inanimate money/gun amalgamation is the “real deal.” “Also, almost all of the supporters say they feel like they could have a beer with the pile.” At press time, pundits speculated who the pile would choose as its running mate: a shuttered Planned Parenthood or a deported immigrant.